The Shreveport Little Theatre’s annual gala will bring fashion and theatrical costuming to the runway at the Margaritaville Resort Paradise Theatre on Saturday, April 13, from 11a.m. to 2 p.m. Anticipated to be a sold-out, fun-filled affair, 300 fashionistas will enjoy a brunch buffet, mimosas, bloody marys, and silent and live auctions. Joining Robert Darrow, SLT managing and artistic director, in the program will be men, women and children who participate in all aspects of SLT productions, modeling current fashions from local clothiers and depicting scenes from SLT productions. Guests will also be “walking the runway” and posing for photos. The modeling will be at both floor and runway levels, interspersed during the event giving guests time to enjoy brunch and the silent and live auctions, which will include dinners, parties and more. The gala will close with a runway and room filled with fashion and theatrical costuming. “This Guild gala is the single most exciting and important event of the year for SLT. This fun occasion brings together those in our community who love theater and appreciate SLT’s rich history in American theater. 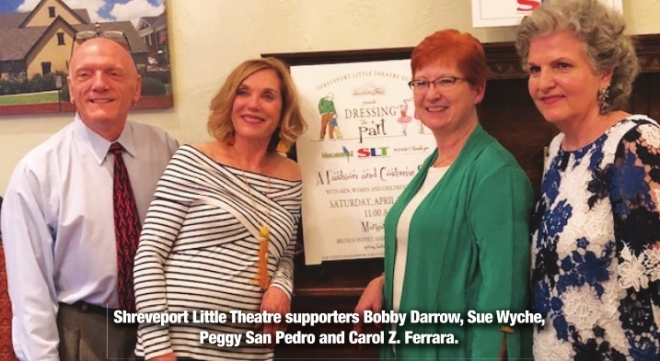 Without the funds raised by our patrons at this gala, SLT would not be able to fulfill our mission of presenting quality live theater to our region,” Darrow said. Darrow is recognized for his commitment to creative artistry, innovative programming, and audience and community engagement. SLT is excited to be the first theater in the region to receive the rights to produce “Mamma Mia!,” the theater’s 2019 summer musical. Having a vibrant theater in Shreveport adds to the region’s cultural vitality and quality of life, according to SLT’s artistic director. When putting together each season, Darrow says the goal is to provide a range of experiences that will speak to people of all backgrounds and ages and to present shows that are warm and welcoming to theater aficionados and firsttimers alike. Gala event co-chairs are Sue Wyche, Dr. Gerry and Peggy San Pedro, and SLT Guild President Carol Z. Ferrara. Emcee Mike Martindale and celebrity auctioneers will be hosting and toasting. Funds raised at the gala support not only the season performances but also the theater’s robust education and community outreach programs. Now in its 97th year, the Shreveport Little Theatre is Louisiana’s oldest continually operating community theater and one of the most respected regional theaters in the U.S. Darrow is enthusiastic about the theater, its reach and its impact. “Theater provides opportunities for us to escape, to educate and transcend the routine of everyday life. When the lights dim in the theater, SLT audiences are prepared to experience hilarious comedy or gripping drama. Good theater comments on our society, our experiences, and our hopes and dreams,” he said. Tickets: Adult, $100; children, $37.50. Sponsorships are from $300-$5,000. Individuals, companies and foundations are invited to sponsor the gala. For tickets/ sponsorships, contact: Sara Coleman at (318) 286-0155 strongtreemassage@gmail.com or visit visit: www.shreveportlittletheatre.com.